A Spanish government official awaits a transfer in a Kafka-esque purgatory in rural Argentina in Lucrecia Martel's dazzlingly surreal Zama, a period drama that takes a withering look at contradictions of identity born of colonialism. Diego de Zama (Daniel Giménez Cacho) spends his days wandering around the rural Argentinian coastal town after requesting a transfer from from the territorial governor to the town of Lerma. 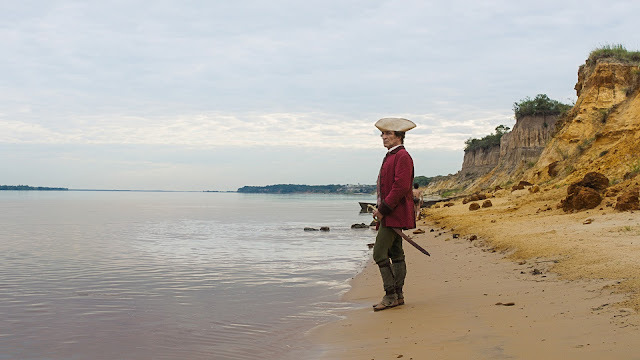 Desperate to leave the uncivilized wilderness behind, Zama finds himself surrounded by similarly displaced Europeans who insist on adhering to old traditions - wearing fine clothing and impractical wigs, all languishing in the South American heat. Yet Zama is not a European. He was born in Argentina to European parents, but has never actually been to his home continent. As one fellow Spaniard remarks, "“Europe is best remembered by those who were never there.” This ignites in Zama a deep crisis of identity. Is he European? Is he South American? How long must he stay in Hell's waiting room before he is finally free to be himself? The problem is he has no idea who he is. Martel creates a haunting portrait of colonial ennui in which the colonists find themselves in an existential crisis of their own design. They enslave and subjugate the natives, but for what purpose? So they can rot in an early grave far from home, lost amid unfamiliar locations and traditions, dreaming of returning to the land of their birth? Martel traps her characters within the very frame itself, often framing Zama in medium close-up, as if he is too big to fit in the shot. By the time Martel frees him from his cinematic cage, it may be too late for him to save himself. And so he remains trapped in a world that seems strangely off-kilter, where characters repeat lines of dialogue for no reason (and don't appear to realize they have done so), and Zama seems to be the only one who notices. It's as if the spirit of Luis Buñuel has settled upon the film, recalling the surrealist satire of films like The Exterminating Angel, where characters become trapped in existential webs they've spun for themselves. And yet what Martel has achieved here feels so singular. Zama is a dizzyingly original creation all its own, created through Martel's own lyrical screenplay (adapted from the novel by Antonio Di Benedetto) and her clever use of non-diegetic sound, which almost imperceptibly enhances the film's diegetic sound design to suggest a sense of creeping madness and displacement. Zama knows he does not belong here, yet doesn't even know enough about himself to articulate why. By the time tensions with natives come to a head, the whole colony is in a state of mental and emotional disarray, as Zama finds himself on a quixotic quest to track down a murderer that has already been executed (or has he?). It is that sense of hazy confusion and collective societal amnesia that defines Zama. Martel tackles the inherent contradictions of colonialism and its destructive history by subtly tweaking its practitioners with sly humor and a devastating satirical eye. What, in the end, was the purpose of it all? The characters ponder that very question themselves, as Martel parses through the violent human subjugation and the arrogance of the "white man's burden" that defined European conquest, in the process delivering a towering work of magical realism that takes a hard look at our present through the lens of our past. 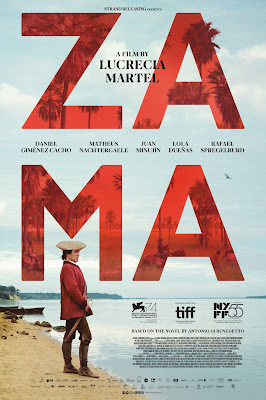 ZAMA | Directed by Lucretia Martel | Stars Daniel Giménez Cacho, Matheus Nachtergaele, Lola Dueñas, Juan Minujín, Rafael Spregelburd, Daniel Veronese | Not Rated | In Spanish w/English subtitles | Now playing in select theaters.